Are You Up To Speed With Google's Latest Marketing Options? Dr Dave Chaffey delves into the latest updates to Google's marketing tools, including Ads, Shopping and Amazon Advertising. Read more. It used to be that changes Google's organic search algorithms were in-constant flux, but in 2018, the main visible changes have been in the paid media world and in the way Google describes its offers. If you're using Google's Ad options 'hands-on' you will have 'got your head around' the changes already and this may be old news, but for business owners who aren't following Google so closely, or startups considering their investment in Google, we thought a round up of the latest changes would be helpful. For more experienced marketers, we'll look at the changes within Google Ads towards the end of the article. Google seems to delight in name changes, you may recall that due to Google's innovation and experimentation in AI technologies with applications such as healthcare and transportation, Google created a new holding company Alphabet in 2015 with the delightfully obtuse domain https://abc.xyz/. To understand how businesses are investing in Google now, we have to turn to the Alphabet reports. The latest Q2 2018 results for Alphabet shows that ad revenue rose 25% during the second quarter of 2018, compared to the same period last year. It generated $26 billion, excluding traffic costs paid to partners. The gains weren’t just from Google advertising revenue, which accounted for 86% of Alphabet’s revenue during the quarter. Google’s other revenues, including cloud services, hardware, and app sales, increased 37% to $4.4 billion over the same quarter a year earlier. So, clearly businesses are continuing to actively invest in Google adverts, but what we call them have now changed, so when discussing investments in Google's it pays to 'get' the new lingo. Google was best known for its flagship Pay Per Click AdWords search engine, but it also bought DoubleClick over 10 years ago to enable ad serving and reporting across display networks. Providing an integrated suite of platforms is welcome since it will help clients and their agencies more readily buy and optimise media using previously separate tools such as Search Ads 360 (formerly DoubleClick Search) and Display & Video 360 (formerly DoubleClick Bid Manager). Plus it showcases other insights and analysis sources such as surveys, analytics and Data Studio which were previously standalone tools. 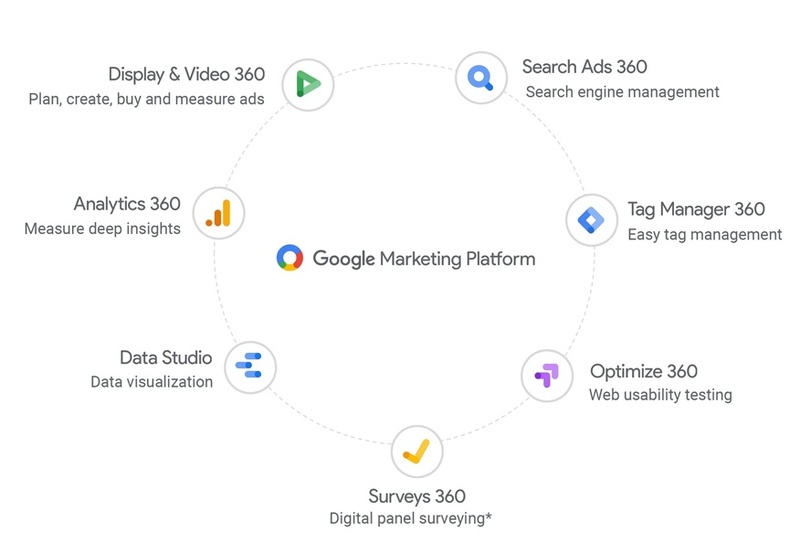 Here's a summary putting the elements of Google Marketing platform together. Note that 360 refers to the enterprise versions that are targeted at larger businesses who may pay for support and improved service, for example through paying for Google Analytics with support and improved data accuracy without sampling. For smaller businesses, the majority of these tools are available for free as shown here. I'd like to call out Google Data Studio as a massive step forward beyond what was available in Google Analytics for custom reporting on digital marketing performance in terms of style and insight. This tool will reduce the need for paying for separate expensive insights and dashboard services. Is Google Marketing Platform a Marketing Cloud? In a word, in my view, 'No'. The intention of creating their platform and the brand name behind it, is to suggest this is a single source marketing cloud service that covers all parts of managing customer lifecycle interactions from acqusition through conversion and retention. Yet, there is a huge gap in that Google's platform doesn't include CRM features which are essential for email marketing, mobile push messaging and customer management for nurturing and support for sales. While this is the case, brands will still need to turn to full, integrated marketing cloud solutions such as Adobe, Salesforce or Oracle, or others which are particularly popular for B2B marketing such as HubSpot and Marketo. We will have to wait to see whether Google makes a move into CRM to add to its platform or improved integration as suggested by this announcement of deeper integration between Salesforce and Google. Google's own financial figures don't give detailed insights on the adoption of Google Ads. Yet they do give top line figures of their growth and the level of competition. Search Engine Land reported that in the latest Q2 2018 Ads earning report, aggregate paid clicks were up 59 percent year over year. Yet CPCs were down 19 percent. The growth in paid clicks is probably partly attributable to increased prominence of ads and especially mobile ads in search results, and the decrease in CPC suggests better understanding and management of ROI by clients and their agencies. The Merkle report, referenced below shows that, for their clients, on mobile devices, organic search clicks produced just 24% of site visits in Q2 2018. Google is no longer reporting click volumes and trends for Google Network properties, but the earnings suggest clicks from this source are static and account for around one fifth of Google's ad revenue. For more detailed insights the Merkle digital marketing report is a great source of insight, which reports aggregated data in the US although they have reduced insight about the UK in the most recent report. For retailers, Google Shopping ads have been important since their launch, but their increased popularity means that they need special management and optimisation. Merkle suggests that Shopping Ads now account for around 60% of Google Ads on spend both sides of the Atlantic. In Europe, retailers in-the-know and with the right agency and tech to support it have been taking advantage of Google Comparison Shopping Services (CSS). In this blog post we describe how ClickThrough Marketing clients can take advantage of the discounted Cost-per-Click available. Google CSS have been developed as a result of a European Union anti-competitive ruling related to comparison shopping services in Europe. Google has opened up the auction to third parties and is running a discounted auction for non-Google properties. This analysis suggests that CPCs are on average of 20% through adopting CSS. This is a huge amount, so it will be interesting to see how this affects competition in the marketplace. by Google’s specific audience targeting products, including: remarketing lists for search ads (RLSA), Customer Match, and similar audiences. This rate was up from 21% of clicks a year earlier. Given the importance of this trend, we'll take a look at the implications of these techniques in more depth in Google and other advertising platforms in my next article. Amazon has had ad options for many years, which were effectively a sponsored search advertising option triggered by keywords searched and the text context of the results page. As the dominance of Amazon in retail has increased, the opportunity for retailers to use ads to compete with Amazon either, through the marketplace or their own stores has increased. Amazon advertising is now a much broader product with the traditional sponsored ads and also with display, programmatic and video ads which are available through third-party publishers. 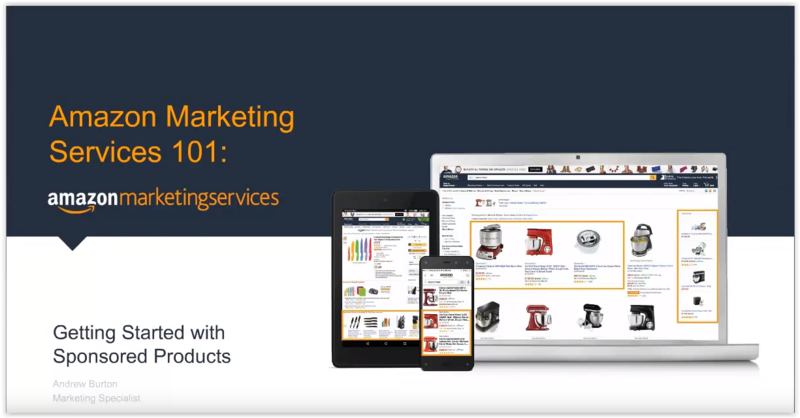 According to Merkle Amazon Sponsored Products spend grew 165% year-on-year in Q2 2018, while Headline Search Ads grew 162%. Sponsored Products continue to account for the vast majority of Amazon search spend, with Headline Search Ads and Product Display Ads accounting for just 12% of spend combined. Interestingly, the Merkle data shows that clicks from both Sponsored Products and Headline Search Ads convert at about three and a half times the rate of Google Shopping ads, looking across all brands bidding on either format. This review shows that innovation in paid search is alive and well, so shows the need to innovate your approach. If you'd like to discover more about Google's latest marketing options, get in touch with our team of experts.